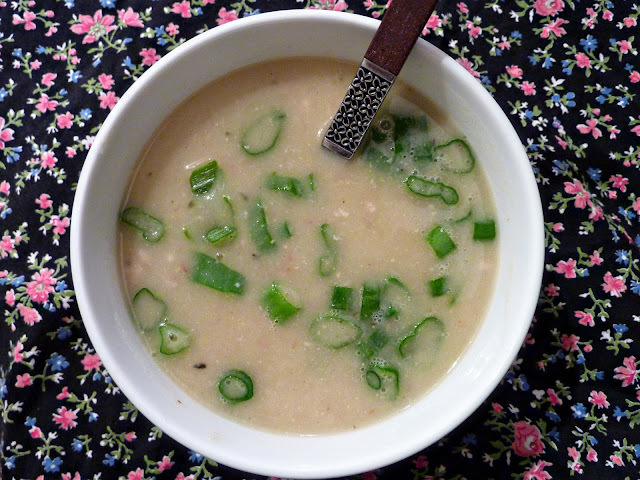 Not sure if you noticed, but I have a thing for creamy soups. Not sure if you noticed, but I also have a thing for bacon. Bring them together in a simple and inexpensive one-pot dinner and you'll see one happy domestic engineer standing in my shoes and wearing my apron. Being dairy-free for the past few years we've gone without creamy things for far too long. I have finally decided to put my foot down and call an official end to the lack of all things creamy in our lives. Use only the bottom portion of the leek—the white and bright green part. 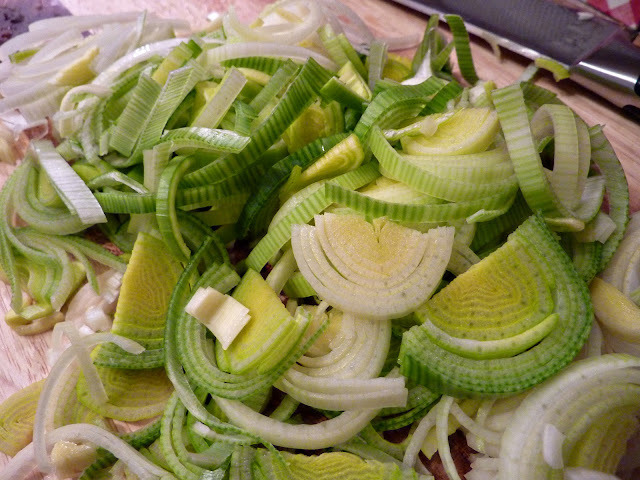 Slice the leek down the center and rinse under cool water to remove any lingering sand and dirt. Once all cleaned up, slice thinly and set aside. Peel and cube the potatoes. Set aside. In a large soup pot, brown the bacon over medium-high heat until crisp. 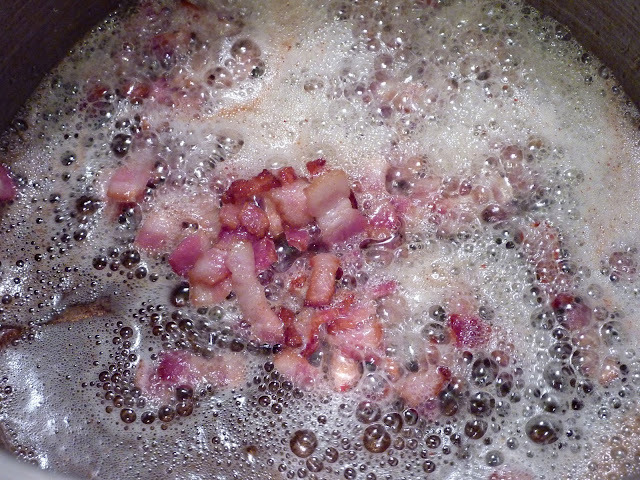 A) Cook the bacon into the soup. 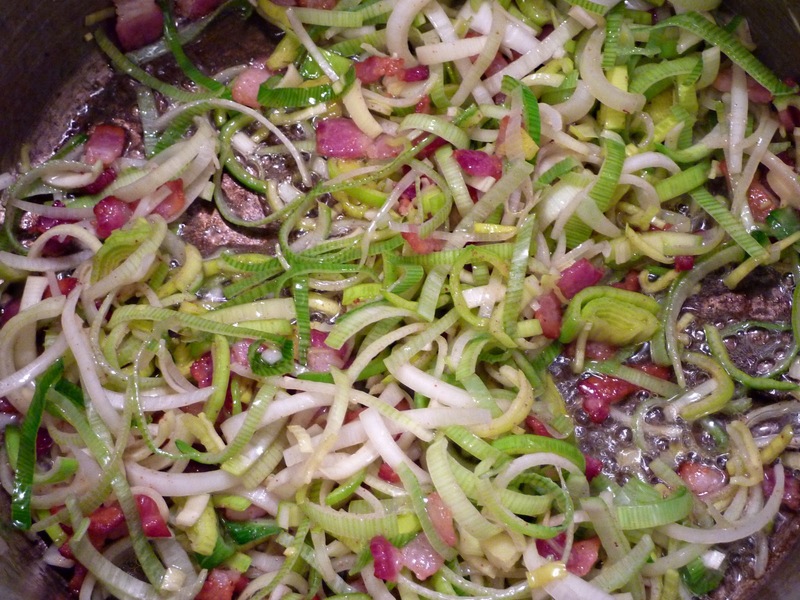 This will mean that you will add the leeks to the bacon in the bottom of the pot, and then puree the bacon at the very end along with all of the other ingredients. 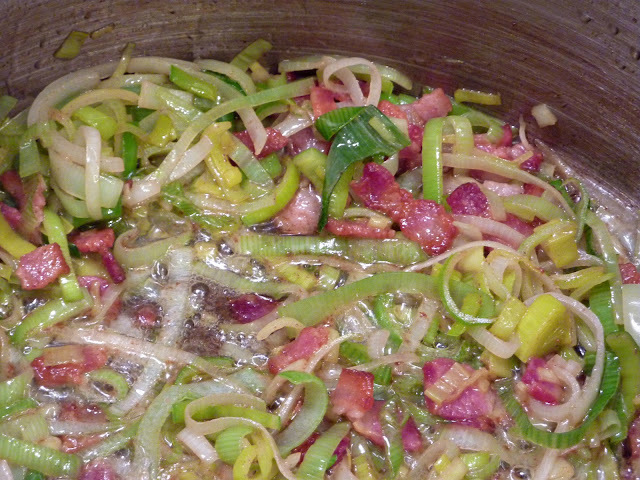 I found this to lead to a very heavy soup, almost too strongly infused with bacon flavor, if that is even possible. Personally, I prefer option B. 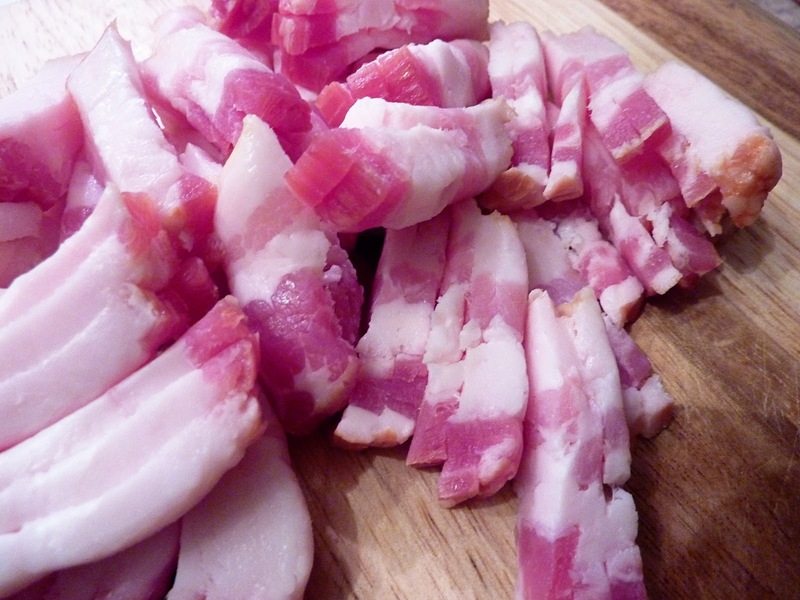 B) Once the bacon is cooked to a crisp, remove it from the pot and set aside. 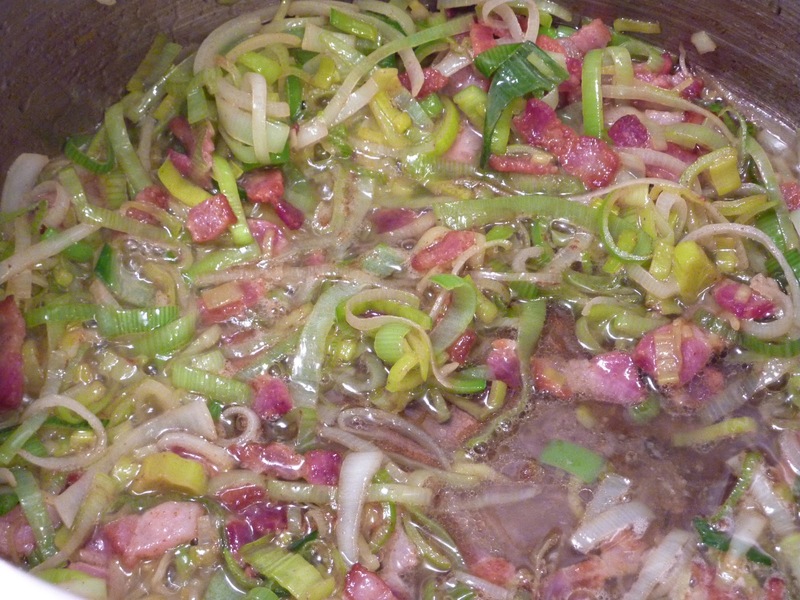 Stir in the bacon chunks after the soup has been pureed. This method offers fun little surprises in every bite. By now you've decided if you're going with Option A or Option B. This picture depicts a cook who chose Option A. Either way, saute the leeks in the bacon grease. If you've got a swimming pool worth of grease in the bottom of your pot, you may decide to remove some (but not all) before adding the leeks. Either way, saute the leeks for about 5 minutes, or until they have softened. Now add the white wine and bring to a boil. 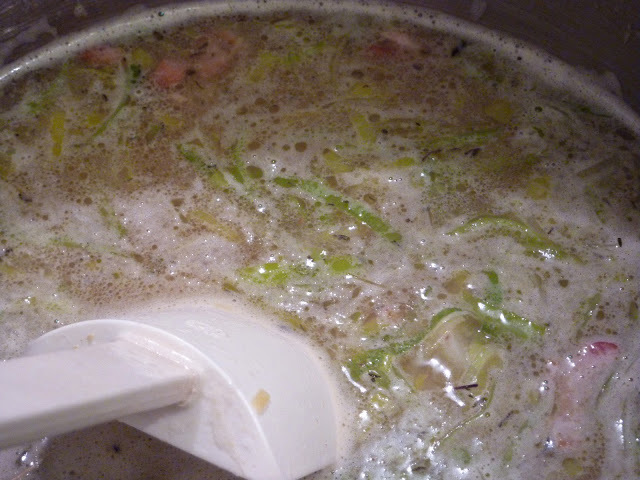 As soon as it begins to boil add the chicken stock, potatoes, fresh thyme sprigs, bay leaves, white pepper and salt. Bring to a boil. 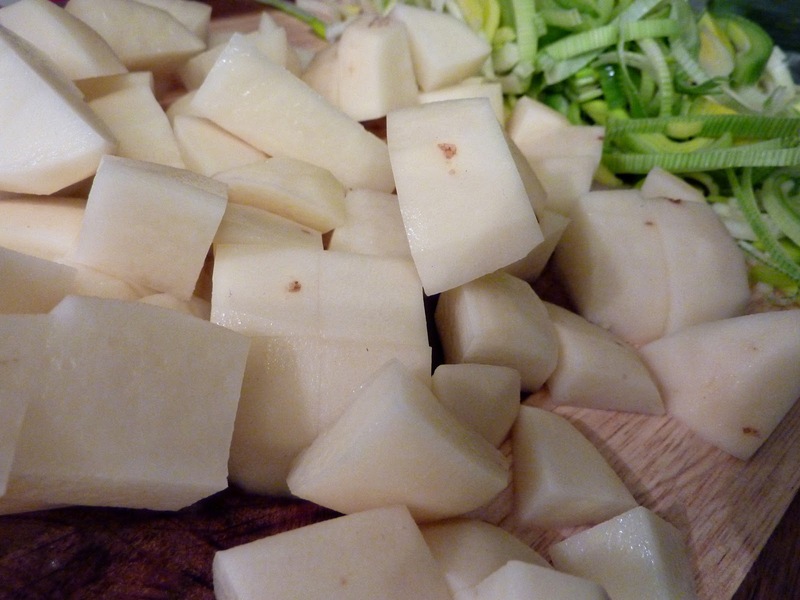 Cover, reduce heat and simmer for 30 minutes or until potatoes are easily pierced with a fork. 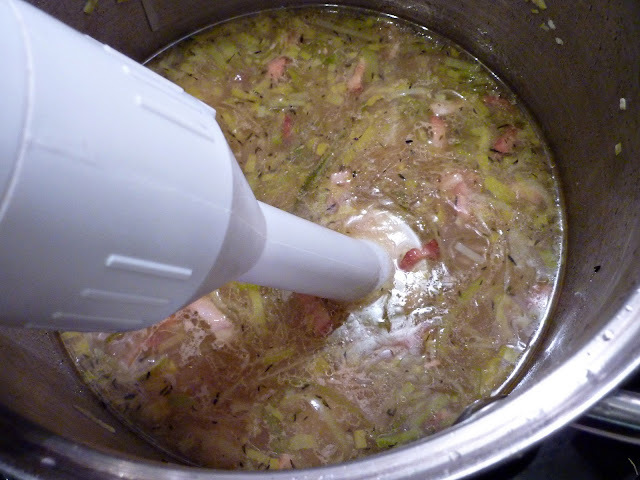 After 30 minutes, remove the bay leaves and fresh thyme sprigs and bring out your handy immersion blender. Blend soup until smooth. If you chose Bacon Option B above, you'll want to add the crispy bacon back into the soup now. I heard this song on the radio today and it's been playing in my head ever since. Gotta love me some George.